14. The material of cutting knife and punching mold:Cr12 quenching treatment. 15. Electronic control system:The whole machine use industrial computer PLC Siemens frequency conversion to control. To prevent the plate move in production process to keep the product quality. The leveling machine is compose of plate material guiding device,guide plate driving roller, adjustable guide device on both sides, leveling roller and etc. The leveling machine have a separate motor drive and the speed is slower than main drive motor. In the head of the reducer shaft installed overrunning clutch.Firstly the motor drive feeding material,then workpieces into main drive roller, and due to the effect of the overrunning clutch, the front drive motor is in a passive state. Due to the main diver motor's speed is faster than front drive motor,when plate material cutting down,between the workpieces will have a distance. 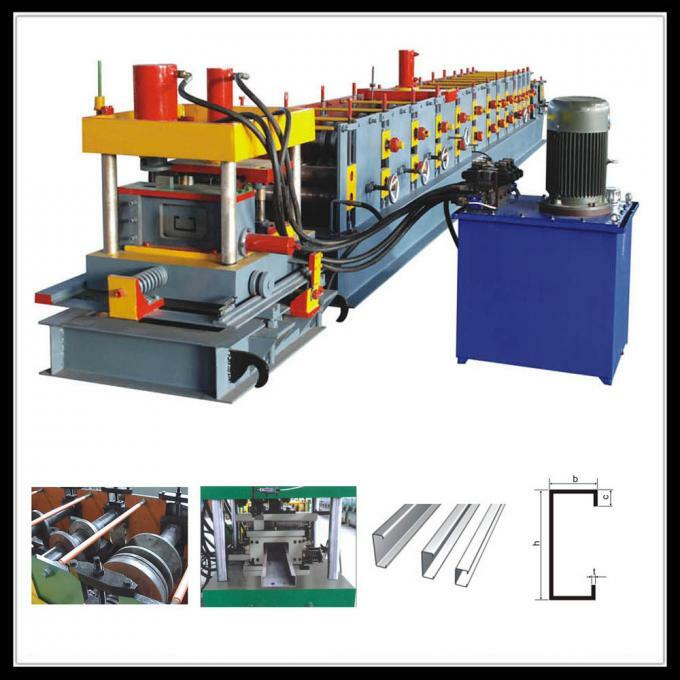 When a batch of workpieces are finish, the steel coil needs to be remove,and the front drive motor will be stop.When all the finish workpieces are completely out of the roll forming machine, the front drive motor will inverse motion and exit the steel coil. structure type:Hydraulic punching device rack is use gantry type. The power source is the pressure of under oil cylinder:The hole position is longitudinally fixed and can be adjusted transversely. Function:After input the length parameter of workpiece through PLC,the encoder will counting length and when the workpiece length is enough the hydraulic cutting machine will cut down the workpiece. The roll forming machine is compose of drive motor, frame, forming roller,Manual regulating workpieces specifications device. forming roller driving motor using 15kw hardened gears reducer ,frequency control and encoder control brake. The frame uses the channel steel as the main beam,and the middle is welded by the stiffener plate. The forming roller is use the method of two sides formed and the form of middle cut off. The forming roller through the motor driven sliding screw rod to adjust the workpieces specifications. Between the two sliding screw rod use the bevel gear to drive and made them to achieve complete synchronization also with self-locking function. 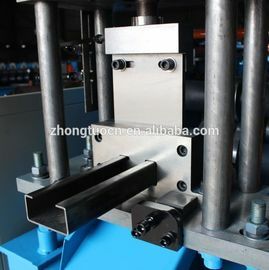 The thickness of the steel plate is adjusted by adjusting the eccentricity distance of the passive roller. The leveling machine have a separate motor drive and the speed is slower than main drive motor. In the head of the reducer shaft installed overrunning clutch.Firstly the motor drive feeding material,then workpieces into main drive roller, and due to the effect of the overrunning clutch, the front drive motor is in 2. a passive state.